If there was a theme uniting everything shown at Electronic Arts’ E3 event, it was drama. From Madden NFL 18, the yearly iteration of EA’s football franchise, bearing the character-focused subtitle “Longshot,” to the Fast and Furious-like Need for Speed: Payback, every game EA showed focused on characters front and center. The angle is refreshing, to be sure. Since story is so often shortchanged in games and characters are often thin and underserved even in the most story-driven titles. A version of Madden that tells the story of a player fighting his way into the league, or a FIFA game about a superstar dealing with the fame, bring angles to genres that I usually ignore but am suddenly very interested in. The trouble is, I’m not sure I believe it. Follow video games for any length of time and you learn to mistrust developers’ pie-in-the-sky design dreams. The realities of game development at work often lead to major changes in games that render trailers obsolete. As a result, games often look one way in a trailer and come out very different when you’ve actually got a controller in your hand. But it’s hard not to be intrigued. Games often struggle with developing well-rounded characters. There’s a push and pull in every game between giving players the freedom to drive their experiences, and delivering information about characters desires, which drive their stories. The result is that many video game stories feel half-fulfilled: Often, the plot is just pushes you to the next bout of gunplay, or the next match, or the next puzzle. If a level that’s essential to the story isn’t working from a gameplay standpoint, it’s the story that gets altered — often to its detriment. EA slipped a number of interesting things into the press conference that suggest a bigger emphasis on story than in years past. 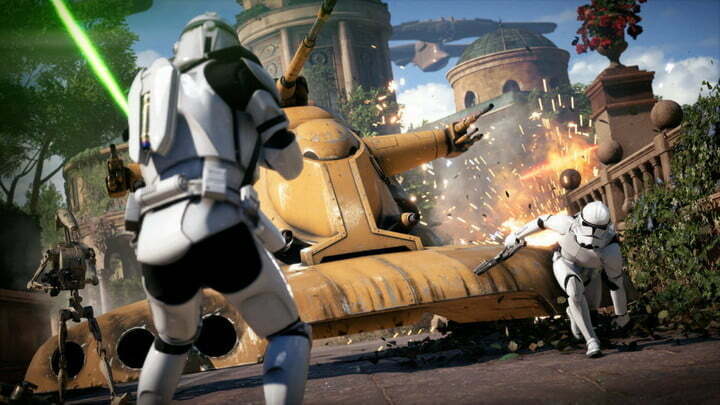 But EA has been angling toward using video games to delve into drama of late. The Battlefield franchise in particular has done some interesting things with not just putting players into insane warfare situations, but in letting them inhabit specific, unique characters. Battlefield Hardline looked to tell a crime drama of a story in which cops have to go outside the law to battle corrupt authorities. Battlefield 1 spends its entire single-player campaign digging into the experience of World War I through the stories and experiences of several very different characters. It’s debatable whether those games actually succeed at bridging the telling of a story with the idea of interactively taking part in one — it’s the big challenge video games struggle with as they try not to fill themselves with sort movie cutscenes to break up gameplay. But the fact that EA is trying with all so many of its games, several of them titles that have been accused of being little more than annual improvements and roster update, is enough to get players to sit up and take notice. EA slipped a number of interesting things into the press conference that suggest a bigger emphasis on story than in years past. Probably the biggest, most fascinating addition was Moonlight’s Mahershala Ali showing up in Madden 18. As the player character’s father who inspired him to chase dreams of the NFL, Ali is a heavy hitter who could bring serious gravitas to the story. But casting isn’t storytelling, as many a star-studded game can attest. At the very least, it signals an investment by EA of a different vein than the likeness of Tom Brady or bringing players to a studio to motion capture their endzone celebrations. Star Wars: Battlefront II contains a full campaign this time out, showing the story from the perspective of an Imperial officer and her unit starting with the destruction of the Death Star in Return of the Jedi. NBA Live 18 lets players create a character, then take them through building a reputation on and off the court, in a way that seems focused on making a personal character that isn’t just a basketball player, but rises to the ranks of superstar. The question is whether this focus on character and drama is really at the heart of these games, or if it’s just an angle that makes for an exciting press conference, and bankable cinematic trailers. After all, Battlefield 1 is still primarily about huge multiplayer battles. So is Star Wars: Battlefront. The Madden franchise is about simulating sports, often against friends and other players online. Same with FIFA and NBA Live. And Need for Speed has had some compelling cops-and-robbers-type stuff in the past, but nobody’s accused the franchise of elevating interactive storytelling. And given that many of these stories are added to EA’s cash-cow sports franchises, it’s tough not to be dubious about the prospect. Madden is so often accused of selling the same game with a few improvements year after year because EA doesn’t want to meddle with a good thing. Throwing a story featuring Mahershala Ali into your extremely stabled football franchise — that’s meddling. Still, the prospect of experimentation is exciting. EA is doing with its multiplayer franchises what so many developers and publishers were doing with their single-player franchises just a few years ago: experimenting, in hopes of landing on something that catches fire. It wasn’t so long ago that talk in the games industry centered on single-player games approaching extinction. It’s refreshing to see a big publisher spend its entire E3 press conference promoting deep, dramatic, character-driven single-player stories for its biggest franchises. All that said: I’ll believe it once I’ve actually played some of these games.